May Day Celebration at Hastings Ranch Nursery School! Hastings Ranch Nursery School invites our entire community to celebrate the May Festival, our annual family day on May 1st from noon to four o’clock. Bring your family and friends (Heck, bring everyone you know!) to enjoy some good clean, silly fun! Our festival will include creative carnival games (designed by our kids! ), an interactive drum circle (musical fun for all! ), drawing lessons (by real artists! 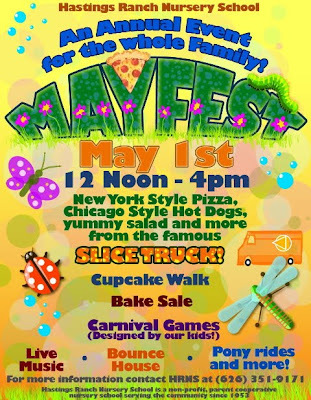 ), a bounce house, story time, live music and even pony rides! And you won’t want to miss the food this year! The famous, SliceTruck will be rolling in with their 28 foot, bright orange truck to feed our hungry crowds with N.Y. style, gourmet pizza, Chicago style hot dogs and yummy salads. Bring your appetite, 20% of the SliceTruck’s proceeds will be donated to our school. After you eat, take your chances at old-fashioned Cake-Walk! There’s a special cupcake walk for the little guys! Don’t worry, if you’re not the gambling kind, just enjoy our bountiful Bake Sale instead! WHO WE ARE: Hastings Ranch Nursery School is an interracial, non-sectarian parent participation nursery school founded in 1953 by caring parents who wanted quality education for their young children. We are a non-profit corporation with membership comprised of all families enrolled during the school year. We are licensed by the State of California’s Department of Health and Social Services to provide an enriched developmental program for children ages two through five. OUR PHILOSOPHY: We strive to nurture the whole family by providing support, partnership, and resources that enable parents to meet the challenges of parenting. Parents at HRNS are committed to the education and socialization of our children and willing to spend the time and energy to be involved. We take an active role in our children’s learning and understand the uniqueness of each child.